If toast had a “Best in Show,” the grand prize would be awarded to Whole Wheat English Muffin Bread. 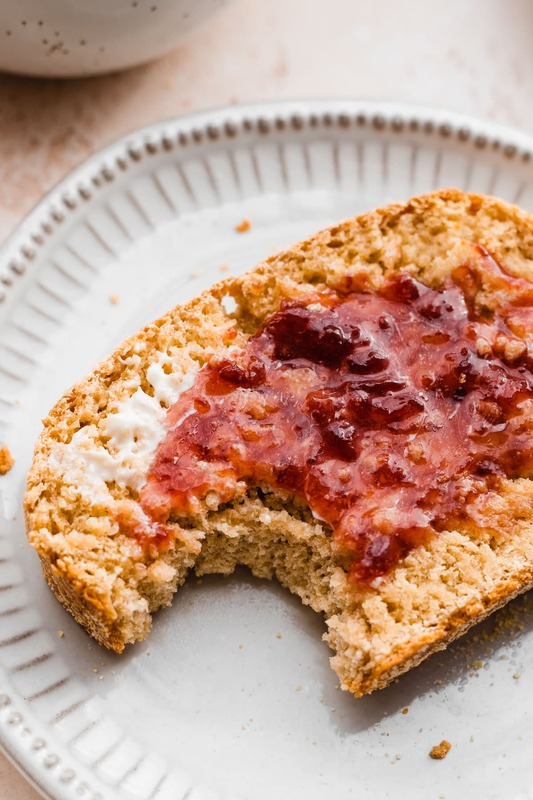 Pillowy enough to give me the fuzzy, contented feelings I seek from my carbs, yet sturdy enough to withstand high toasting temperatures and a thick slather of jam, Whole Wheat English Muffin Bread was made to be toasted, smeared, and devoured. 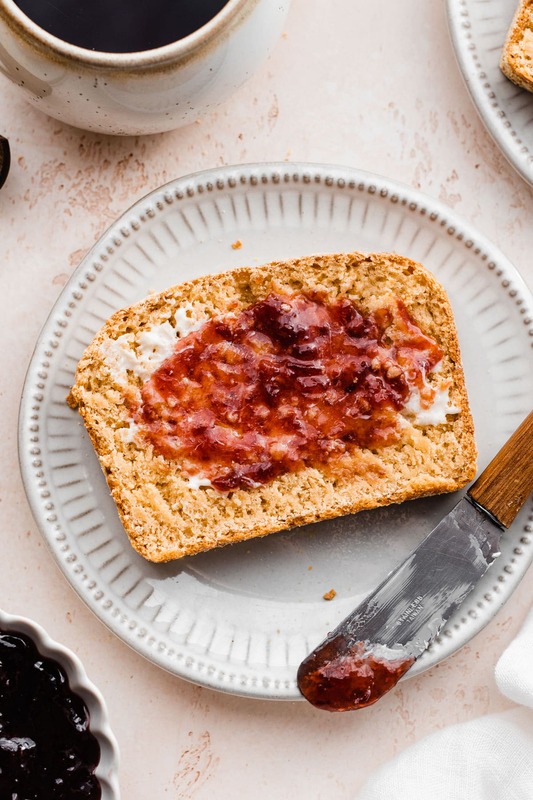 The simple, yet spectacular bread combines the characteristics I love about English muffins—nooks and crannies to trap melted butter in happy little pools; a toothsome chewiness that makes me feel hearty and alive in the morning—with the convenience and ease of a classic sliced loaf. I owe my introduction to English muffin bread (and consequently, a debt of gratitude) to my Grammy. Although she is an accomplished cook, the one lunch I begged her to make me (both as a kid and, ok, last month) is grilled cheese. Forget the white Wonderbread and plastic-wrapped faux-yellow slices—even as a child, I knew that my Grammy’s grilled cheese was superior. Her secret: English muffin bread. The final selling point of Whole Wheat English Muffin bread: it is officially the EASIEST loaf of bread I’ve ever baked from scratch. Two bowls, no kneading, only one rise. 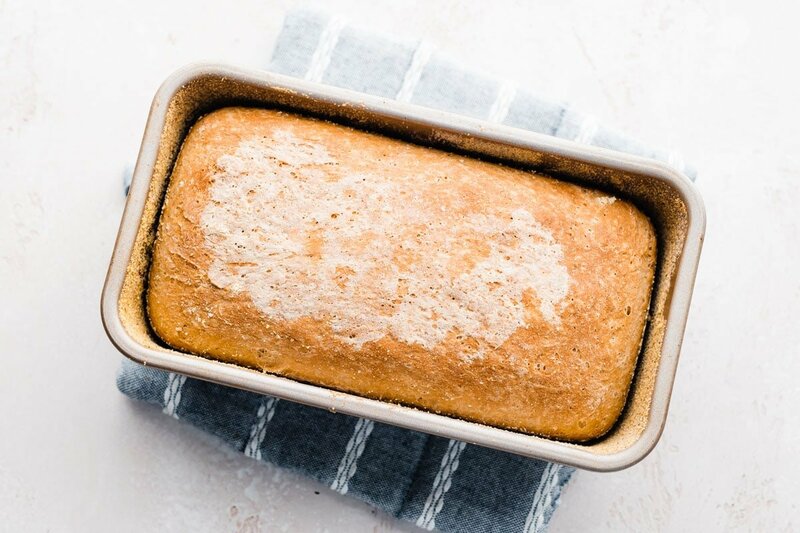 Even if you don’t know where to find yeast in the grocery store, you can bake this bread! Bowl one: dry ingredients. That’s whole wheat flour (I love its nutty flavor and healthy high fiber content), all purpose flour (to keep the bread light), brown sugar (which helps the bread caramelize when toasted, mmmm), and Red Star Platinum Instant Yeast, the only kind I use. 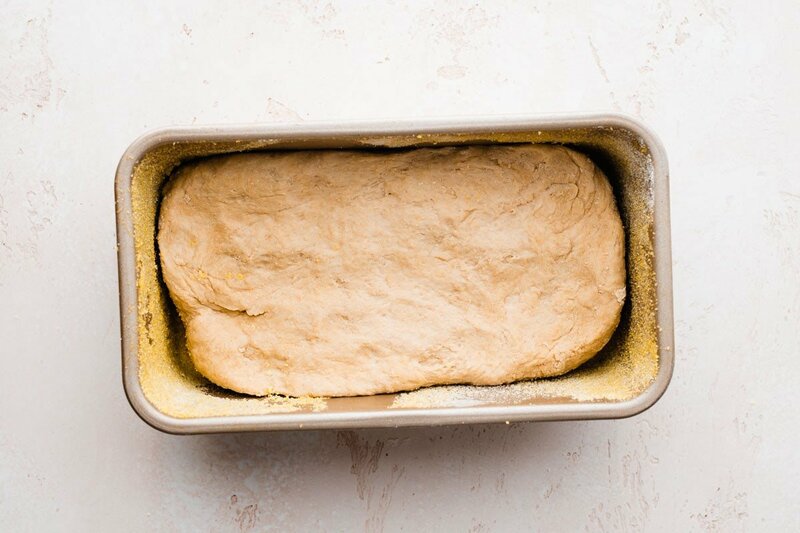 As long as the liquid is the proper temperature before you add it to the bowl and the yeast isn’t expired, your loaf will rise every single time. I bake with yeast weekly, and Red Star Platinum hasn’t failed me yet. Combine bowl one with bowl two, beat the heck out of the batter with an electric mixer, transfer it to a pan, and…that’s it! The dough rises right in the pan, then emerges from the oven as a golden, glorious loaf of English Muffin Bread. The toast with the most. 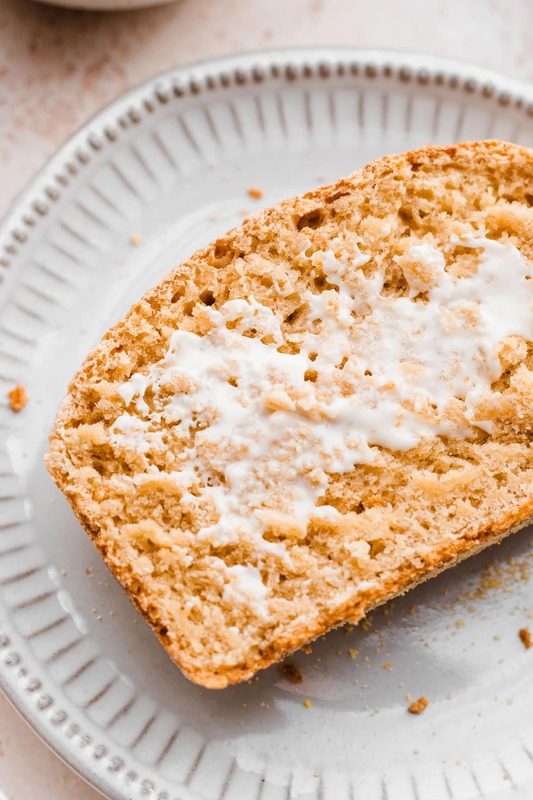 The best, easiest recipe for English muffin bread. It tastes just like an old fashioned english muffin but is much simpler to make. No kneading required! Lightly grease an 8 1/2 x 4 1/2-inch loaf pan with cooking spray. Dust the bottom and sides with cornmeal. Set aside. In the bowl of a standing mixer fitted with the paddle attachment or a large mixing bowl, whisk together the whole wheat flour, all purpose flour, vital wheat gluten flour (if using), brown sugar, yeast salt, and baking soda. In a microwave safe bowl or large measuring cup, combine the milk, water, and oil. Microwave in 30 second intervals, until the liquid reaches the temperature directed by the yeast manufacturer (120 degrees F to 130 degrees F for Red Star Platinum). Stir the liquid together well before taking the temperature, and for best results, use a digital read thermometer. The liquid should feel hotter than lukewarm, but not so hot that it is uncomfortable or burns. Pour the hot liquid over the dry ingredients, then beat the mixture on high speed for one minute. The dough will be very soft, somewhat sticky, and moist. Transfer the dough to the prepared pan, then press it gently with the back of your hand to make it as even as possible. Lightly grease a sheet of plastic wrap with cooking spray, then cover the pan and let rise in a warm, draft-free place, until the dough just barely rises over the top rim of the pan, about 1 hour, depending upon the temperature of your kitchen. (Alternatively, you can place the loaf in your refrigerator to rise overnight. Let stand at room temperature for 30 minutes prior to baking.) Towards the end of the bread’s rise time, place a rack in the center of the oven and preheat oven to 400 degrees F.
Once dough has risen, remove the plastic wrap and bake for 22 to 27 minutes, until it is golden brown and the interior temperature registers 185 to 190 degrees F. Check the dough at the 15-minute mark—if it is browning too quickly, lightly tent the pan with foil, then continue baking until the bread is done. Remove the bread from the oven and let stand for 5 minutes in the baking pan. Gently turn the bread out from the pan and place on a cooling rack. Allow bread to cool completely before slicing. i have been wanting to make a different type of bread and you have just done it. thanks a lot. i will let you know how it went soon. We are on the same wavelength today! English muffin bread is the best! I always wondered what made english muffin bread different! Thanks for explaining! This sounds absolutely divine. I make english muffins pretty frequently but I haven’t made a loaf yet! I can’t believe it’s only one rise, too! Sadly, my grandmother never had the hand with yeast – I’ve taught her how to use it! English Muffin bread is so good! I just tried making it last year and am so hooked with how easy it is! Yours looks perfect! By any chance have you tried this with spelt flour? Thanks for all the great recipes!! Oh yummy Erin-That looks so good!! I’ll have to try that sometime! English muffin bread took my carb obsession to a new level. That texture is unbeatable! And whoa, who knew it could be so easy?? I think I just found my weekend -project. Gorgeous pictures Erin, and happy weekend! I’ve had English muffins on my mind. But I hadn’t considered making it as a loaf. Genius! Wow! I’ve never heard of english muffin bread but it looks awesome! I know what I need to bake over the weekend. Pinning! This looks SO good! I’ve never tried english muffin bread before. PINNED! Um hi. You just became my most favorite person ever. I LOVE english muffins for their chewiness and the nooks and crannies. But I get weak at the knees over the smell of toasting bread. Never had english muffin bread before, but it looks perfect. Gotta try it asap. 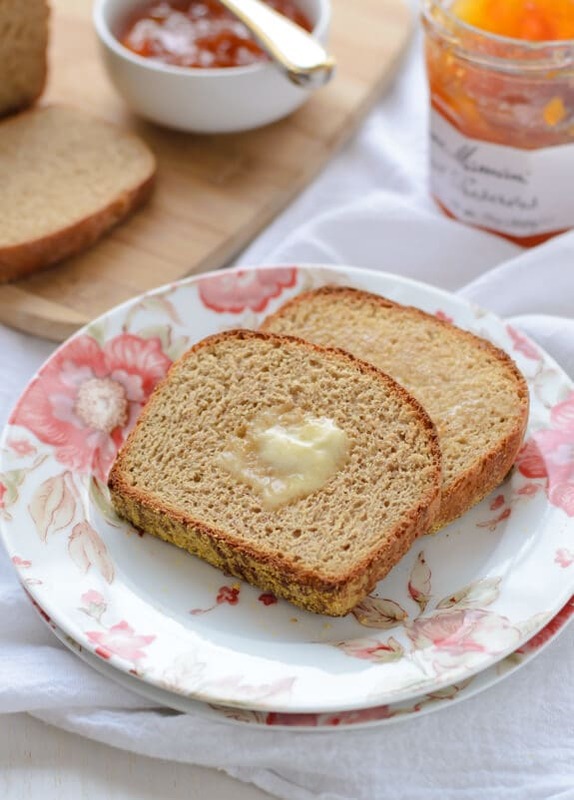 English muffin bread is totally on my list of things I need to bake soon! I make bread ALL the time, I don’t know why I haven’t tried english muffin bread yet. And I love English muffins. So obviously I need to make this soon! It looks amazing, and those photos made me want to go make some toast! :) Pinned! My goal for this year: Making all our bread. So far so good, but I need to mix it up a bit. This looks like a great recipe to try. I love a bread that makes a good toast…not all breads do, but I really do like toast from time to time! Beautiful loaf, lady! I am just dreaming of a slice right now with butter, or cheese, or jam, or peanut butter… or maybe half a loaf with all of the above on each slice. Yes. That. I just made this, and it’s AWESOME! I followed the instructions exactly (but didn’t use the optional vital wheat gluten), and it’s PERFECT! So easy and healthy! Thanks for another great yeast recipe, Erin! You are the queen of yeast! “nooks and crannies to trap melted butter in happy little pools” <– Oh my goodness, now sitting in a pool of drool at my desk! I need to make this. Although I have to eat gluten free I know my boyfriend will love this! And I get to smell fresh bread in the oven. Perhaps I need to try a GF version of this. Scratch that – I NEED to try a GF version of this :) Thinking cap on! I’ve never made bread before but have been looking for an easy recipe… made this yesterday- turned out perfect! Even my husband who said “I don’t like plain bread” ate a slice and said it was really good! Thanks for sharing! Allison, I’m so exited to hear that you and your husband loved this bread so much! Thanks so much for trying the recipe and for taking time to let me know too. It really means a lot! I don’t think I’ve ever had whole wheat english muffin. Sounds so so amazing! I made this bread yesterday, and it is delicious! My family enjoyed it for breakfast toasted with butter and jam. I am wondering if I could use this bread in your Skillet Tomato Casserole (which I have had bookmarked for ages!). Many thanks! Jocelyn, I’m so excited to hear that you all loved this recipe! I think that this bread might be a bit soft for the Skillet Tomato Casserole, however. To be safe, I’d try to find a heartier, crustier loaf that can stand up to the sautéing. I do hope you try the tomato casserole though. It’s one of my favorites! I don’t have a microwave! What should I do? Hi Elle! You can just heat the liquid mixture to the same temperature in a saucepan on the stove. 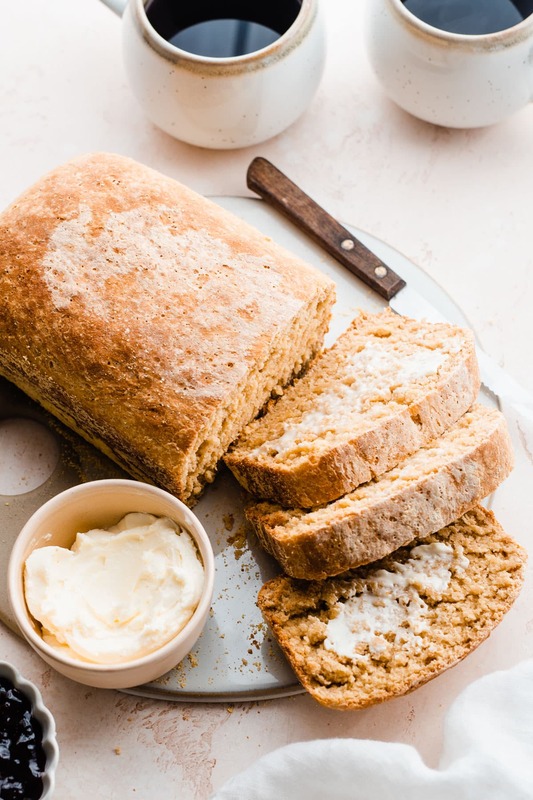 Hi Erin – I can’t wait to try this bread! Many years ago (40 or so) I used to make English Muffin bread in 1lb coffee cans. If was so good, but the recipe is long gone. Yours looks delicious. One question – is it possible to substitute 1% milk for the skim? I never have skim on hand. Thank you for your help. I’m new to your site and really enjoying it :). Is it possible to use all of whole wheat flour? If so, do I add another tablespoon of gluten? I love this recipe by how easy it is but I strictly don’t bake with all-purpose flour (sorry). Hi Chris! You absolutely can. In fact, that’s how I often make it myself :-) Just to warn you, the bread will be much denser. I would suggest adding another tablespoon of vital wheat gluten, and watching The moisture content, as the dough may be a bit dry. If it is, just add more liquid 1 tablespoon at a time (milk or water), until it is tacky but not sticky. I hope you love the bread. It’s one of our favorites! Chris, I’m so sorry to hear this! I know it is disappointing to try a new recipe and not have it come out. My guess is that either a) the yeast didn’t activate properly (could be that the yeast was expired or the water temperature was too hot or too cold) or b) the loaf needed to rise longer, which does happen with 100% whole wheat loaves. Either way, I truly wish this would have been perfect for you! I mixed this bread together using my bread machine to mix only. I am a bread machine girl. I have never mixed dough with a paddle via mixer. Once it was mixed, I followed the directions. Even added the gluten. Mine did need to be tin foil tented at 10 minutes. Turned out really well. I love that it has limited sugar and oils. Thanks so much for the receipe. Lori, I am so happy to hear that you were pleased with this recipe!! It’s great to hear feedback about how this recipe performs in a bread machine too. Thanks so much for trying it and for taking time to share your thoughts as well. I truly appreciate it! How did you convert the recipe to a bread maker recipe? I would like to have it also. Thank you! Leave in mixer bowl for a rise, then transfer to prepared pans, sprinkle top with cornmeal and do a second rise. Improves texture.